Tenet Healthcare Corp. in 2006 paid a record $900 million to settle allegations involving its billing practices. Tenet Healthcare's CEO on Tuesday hinted at behind-the-scenes price wrangling as the company tries to sell its revenue cycle subsidiary, Conifer. Ron Rittenmeyer told analysts and investors on its second-quarter earnings call Tuesday morning that the Dallas-based for-profit hospital chain has improved Conifer's earnings before interest, taxes, depreciation and amortization by more than $70 million over the past three quarters, and it expects cost savings to reach $90 million by year-end. That said, Rittenmeyer shot down one analyst's suggestion that Conifer's better-than-expected performance is dampening Tenet's desire to sell the segment in which it owns a 76% stake. "That doesn't change my enthusiasm," he said. "It just says, 'Look, if we as a company have improved it, then we as a company should get paid for that.' "
Equally important to the price, Rittenmeyer noted, are the contract terms that let Tenet keep tabs on the new owner's performance, including potential penalties and incentives, since Tenet will stay on as a customer. Rittenmeyer said he's met with a few select bidders in recent weeks, but didn't offer names. Sources familiar with the deal told the Wall Street Journal that UnitedHealth Group is in the running. Conifer generated $91 million in adjusted EBITDA during the second quarter, up 51.7% from the $60 million it generated during the same period in 2017. The segment's revenue fell 3.5% to $386 million in the quarter, which Tenet said was primarily due to divestitures. Tenet's stock price was down about 15% Tuesday morning, likely on the news that the company's net operating revenue fell 6.2% in the quarter to $4.5 billion, compared with the same period in 2017. The company's net income totaled $24 million in the quarter, up from a net loss of $56 million in the prior-year quarter, and far exceeding Tenet's own expectations. 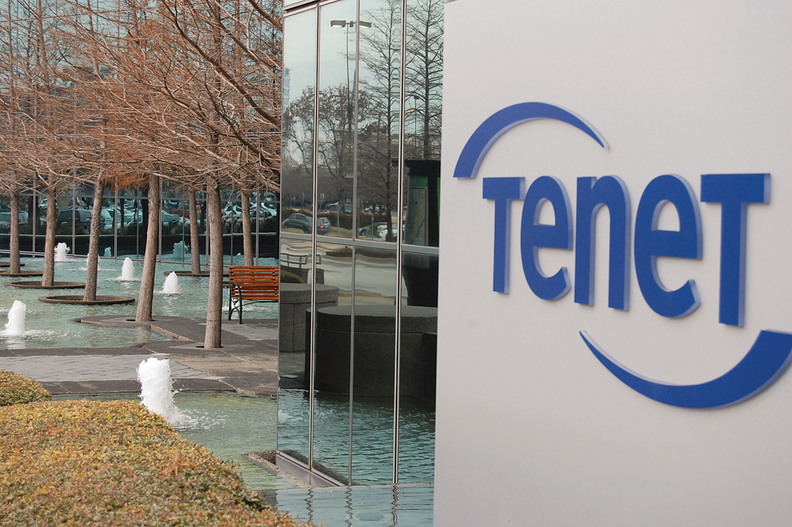 In response, Tenet upped its year-end net income outlook. In Tenet's hospital segment, net operating revenue slid 8.6%, to $3.73 billion during the quarter. Admissions decreased 2.3% in the sector, while revenue per adjusted admission increased 3.5%. Rittenmeyer said he wasn't satisfied with Tenet's volumes in certain markets, and blamed the weak performance in part on struggles in Detroit and Chicago. In Detroit, he said the company is working to mend its ongoing feud with Wayne State University. In May, Tenet's Detroit Medical Center threatened to terminate its contract with Wayne State's physician group, which has more than 300 physicians. Shortly after that, the two agreed to extend the contract by six months while they work to salvage the relationship. On Tuesday's call, Rittenmeyer said the company is determined to remain the leading academic health system in Detroit with or without a Wayne State affiliation. Tenet just signed a definitive agreement to sell its three remaining Chicago-area hospitals, which Rittenmeyer revealed on the call will net the company $70 million. Rittenmeyer said Tenet will continue to evaluate its markets, and he expects the company will exit more in the future, although he didn't name specific targets. He announced a new program in which Tenet executives will visit two key markets every month to study their financial performance and quality to ensure the company is allocating its resources properly. Tenet's ambulatory segment posted same-facility revenue growth of 6.9%, with cases up 4.3% and revenue per case up 2.4%, which is in line with the strong ambulatory growth Tenet has seen in recent quarters. Surgical revenue, which accounts for the majority of Tenet's ambulatory revenue, rose 6.6% on a same-facility basis, with cases up 3.4% and revenue per surgical case up 3.1%. Overall, Tenet's ambulatory segment produced net operating revenue of $531 million during the quarter, compared with $472 million in the second quarter of 2017. Tenet in April upped its ownership stake in ambulatory surgery center chain United Surgical Partners International to 95% for $630 million. Tenet's adjusted earnings before interest, taxes, depreciation and amortization totaled $634 million in the quarter, compared with $570 million last year, which fell within the company's expectations. The announcement that Detroit's Henry Ford Health System has signed a direct contract to provide services for up to 24,000 General Motor employees and dependents in Southeast Michigan does not pose an issue for Tenet because its "overlap with GM's employee base is not as strong," Eric Evans, the company's president of hospital operations, said on Tuesday's call. "But clearly we want to be competitive with them," he said.